Lately I feel as if I'm being forced to choose between Mexicans and Arizonans, two groups I find adorably quaint. Each loves the elderly, Jesus Christ, eating outside, bad music and not the gays. But since SB1070, Arizona's law allowing cops to ask people to show their citizenship papers, is making us all pick sides, I'm going Mexicans. That's because I believe that over the course of American history, our country has come out net positive on the whole immigrant thing. 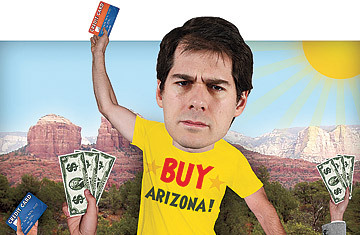 However, when I heard there was a group of fellow Angelenos, "Buy Arizona! Now," that was responding to our city's official boycott of Arizona by going to Phoenix to spend lots of money, I decided to join them. Regardless of my feelings about the law, this was a great chance for me to be politically active. I'm less a marching and chanting kind of guy than a shopping and drinking one. Although the following is all completely true, to protect the innocent, some of the names have been changed on my expense report. The innocent is me, and the names weren't changed so much as invented to make it look as if I didn't eat expensive meals alone. Since the first official Buy Arizona! Now weekend event wasn't until 8:30 p.m. and my Southwest Airlines flight ($321.40) arrived at 3:20, I drove my Hertz rental car ($127.89) straight to Pizzeria Bianco ($80.27), where I bought a drink for a guy named Ted for no reason at all, unless you count caring about our country as a reason. The pizza was so incredible that I did not ask the Mexican guys who made it for their papers. I checked into my room at the Camelback Inn, for which Buy Arizona! Now had negotiated a discount price of $139 a night. I wasn't sure what purpose it served to negotiate discounts at a "buycott," but to be safe, I headed to the bar at BLT Steak to spend the difference. I was joined by the two Buy Arizona! Now organizers  Sonja Schmidt, host of the conservative comedy show Left Exposed on PJTV.com and Tony Katz, a talk-radio host  their spouses and just six other people. We were all going to have to spend a lot more money than my editors and I had anticipated. At the bar, Schmidt had organized a Conservative Night of Comedy with appetizers and drinks ($30). There were a lot of jokes about the Weather Underground and Nancy Pelosi that would have been funnier if I read conservative blogs and had many more drinks. Afterward, I talked to Cindy and Doug Youngblood, who had flown in from Palm Bay, Fla. "We have a grandchild coming. We have construction on our house," said Cindy, who teaches American government to 11th-graders. "But this was important. To get our government to listen." If Obama can't hear Cindy's spa haircut, Hummer tour and the $120 she dropped at the gift shop on Navajo pottery, a metal sculpture and a book signed by Sandra Day O'Connor, then democracy is holding out for jewelry. The next day, while hundreds of people attended a pro-SB1070 rally at the capitol, I went shopping in Scottsdale with Sonja and her husband. The stores were nearly deserted, which had less to do with the boycott than with the fact that Arizona destroyed its economy by building enough empty houses for all other 49 states to move into. I entered a clothing store called Jacquie O Trends where there was a jar to put prayers in for the designer to pray over. When I told Veronica Martinez, the woman behind the counter, why we were in town, she told us she didn't love the new law and liked the boycott even less. "It's getting out of hand. We need to help each other," she said. Still, I think there might be a prayer about us in that jar. That night, I went to the official Buy Arizona! Now Scotch tasting at the Westin Kierland Resort & Spa ($28 with discount). The only other patriot to join me was Ben Freedman, a local video producer. After four generous pours, we met the rest of the group for cigars. But after an hour watching my weak-willed compatriots share nachos, I knew I had to focus on my political mission. So I went to a restaurant called FnB, where I ate delicious local dishes and tried four great Arizona wines ($111.52 + $5 parking). I doubt if even Sarah Palin has drunk an Arizona wine. The next morning before my flight, I went to the Buy Arizona! Now breakfast at my hotel ($21.58) and said goodbye to my new friends. I still disagreed with them, but hearing their opinions made me understand the complexity of immigration policy, boycotts and the placement of exclamation points. I believe we can find an acceptable compromise on immigration. Which very well might be that instead of producing papers, immigrants would have to produce credit cards.